If you want to deploy large data centers—social networking, search engine sites, cloud and content providers and financial services, etc.—that need high-performance computing capabilities, you can consider the Cisco Catalyst 4948E and 4948E-F Ethernet Switches. They are the best ones that offer unique features of enabling critical data center architectures. In fact, in their performance and scalability, the Cisco Catalyst 4948E and 4948E-F switches are identical. And the only difference they have is airflow direction. The Cisco Catalyst 4948E provides front-to-back airflow, and the Cisco Catalyst 4948E-F provides back-to-front airflow. Note that the Cisco Catalyst 4900 Series Switches refer to the port side as the switch front. The Cisco Catalyst 4948E and 4948E-F switches provide the option of front-to-back airflow (Cisco Catalyst 4948E) and back-to-front airflow (Cisco Catalyst 4948E-F) in top-of-rack (RoR) switch deployments. And the following table summarizes the deployment scenarios for the Cisco Catalyst 4948E and 4948E-F to help you decide which switch to use. 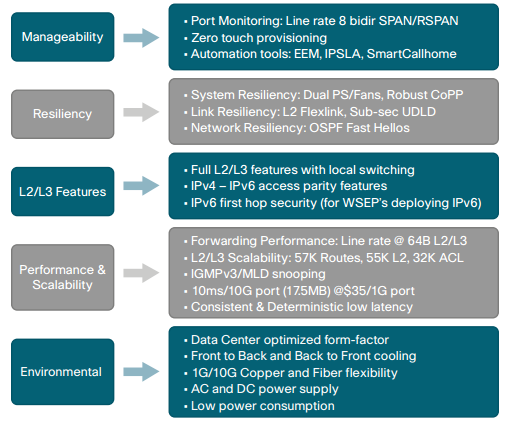 Cold-Aisle and Hot-Aisle Isolation Using Back-to-Front Airflow with Cisco Catalyst 4948E-F. The Cisco Catalyst 4948E and 4948E-F provide strict front-to-back or back-to-front cooling with no vents on the side or top of the switch. And you should know that Cisco Catalyst 4948E cannot be upgrade to Cisco Catalyst 4948E-F. These two switches are different orderable SKUs and cannot be upgraded from one switch to another at customer premises. The power supplies and fan tray are also not interchangeable between the Cisco Catalyst 4948E and 4948E-F. Each of these switches has unique power supply and fan tray and cannot be interchanged. Cisco Catalyst 4948E inherits all the features of the award-winning Catalyst 4948 10Gb Ethernet Switch and also offers 10Gb Ethernet uplinks, front-to-back airflow, and IPv6 in hardware. Cisco Catalyst 4948E support mix of AC and DC power supply in the same switch. Customers can choose this configuration for AC to DC failover resiliency. 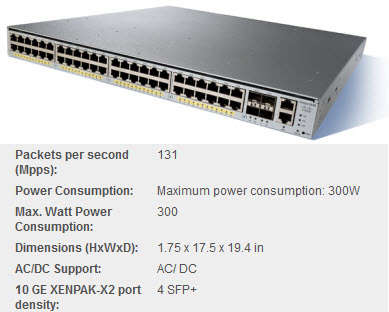 Each Catalyst 4948E and 4948E-F switch provides four nonblocking ports of SFP and SFP+ uplinks. 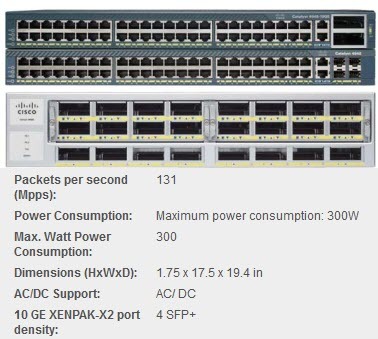 Customers can choose to use these ports in either 1 or 10 Gigabit Ethernet mode according to their aggregation requirements. The management port provides 10/100/1000-Gbps RJ45 connectivity on the Cisco Catalyst 4948E and 4948E-F. Both Catalyst 4948E and 4948E-F switch are members of Cisco Catalyst 4900 Series. The Cisco Catalyst 4900 Series is the industry’s most widely deployed ToR switch portfolio. In a completed third-party testing, network device test expert David Newman deemed the Cisco Catalyst 4948E “a strong, credible choice for top-of-rack service in the data center.” Refer to test report at https://networktest.com/cisco/4948E/4948E.pdf . In that test, you can get a detailed application of a Cisco 4948E switch in a network, which help you make a smart decision. How to Select You Cisco Switch and Router Hardware?